I can't tell you how many times I've passed this bourbon on the shelves, in its fancy box, thinking I need to give it a try. For whatever reason, though, I've always found something else to try, perhaps not wanting to be victim to some gimmick packaging serving no purpose other than marketing. Eventually, though, I had to give it a try. After all, it has consistently received good reviews, is produced the Jim Beam distillery, and is bottled at barrel strength. It was really only a matter of time. After opening the box (which I now have no idea what to do with--perhaps my son can find some use for it), I grabbed the bottle out and immediately notice the dark color, usually a good sign for me. After peeling off the wax, I was immediately hit with the alcohol smell, though the traditional vanilla and spice notes of bourbon were just as prevalent. This particular batch (No. 2014-06) was aged for 7 years, 2 months and 14 days and was bottled at 127.7 proof, and just as with any high proof bourbon, it was very much a sipper with a lot of burn. That being said, this bourbon is full of flavor, and once the alcohol dissipates a bit, the flavors hit the pallate hard! It has a high rye flavor up front, which is followed by black pepper and mint (a flavor I've found I suprisingly really enjoy in whiskey). This bourbon is a great blend of sweetness, spice and burn. Interestingly, I couldn't help but notice what I can only describe as a distinct flavor of yellow cake of pound cake that tended to linger in the back of my throat. 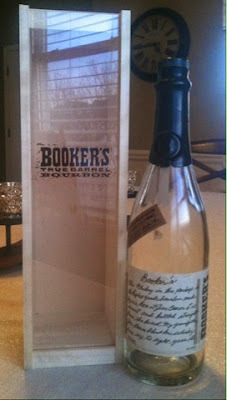 It perhaps lingered a bit because this is a thicker bourbon, with a certain "chewiness" to it. While I usually find that bourbons tend to come into their flavor after being opened for a bit, I found the flavor profile on this one did not change at all, tasting very much the same from the first pour to the last. Overall, this is an excellent bourbon, certainly worth going back to the well for.